The 2019 Porsche Cayenne Turbo gets both the “performance” and “SUV” angles of Performance SUV right. Take it through slick, hilly back trails, and use the PSM sport mode to grip and steer around tight, gritty curves with ease. Spice up your driving experience. Power doesn’t mean anything without intelligent craftsmanship. Depending on what surface you’re driving and what the weather conditions are like, the Cayenne Turbo’s modes will change the shift mapping, suspension, and differential locks seamlessly. The ability to switch between so many performance modes wouldn’t be possible without a beast of an engine, a 4.0 liter twin-turbo V-8. It’s one of the newest engines on the scene, delivering 550 hp and 567 lb-ft of torque. 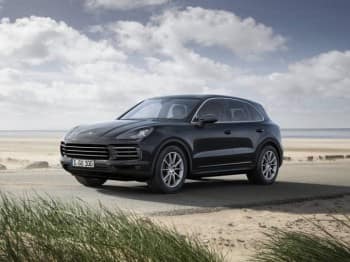 The 2019 Porsche Cayenne Turbo delivers a major new safety technology as well. It’s the first vehicle to boast Porsche Surface Coated Brakes. These brakes are coated in tungsten carbide to both increase friction and reduce wear. You’ll get even better braking while simultaneously extending rotor life up to 20-percent. Trust the Cayenne to keep your family safe. The broad 12.3 inch HD infotainment screen is touch-responsive. By making it large and accessible, the Cayenne eliminates the worry you get from smaller screens of having to hit it multiple times. With a larger screen positioned directly to the right of the steering wheel on the dash, it’s exceptionally easy to make your choices and switch between radio, GPS, and other apps. A 2019 Porsche dealership will be able to give you a memorable test drive in the Cayenne Turbo, displaying its wide array of capabilities.